Fortnite is already racking up the money on iOS. 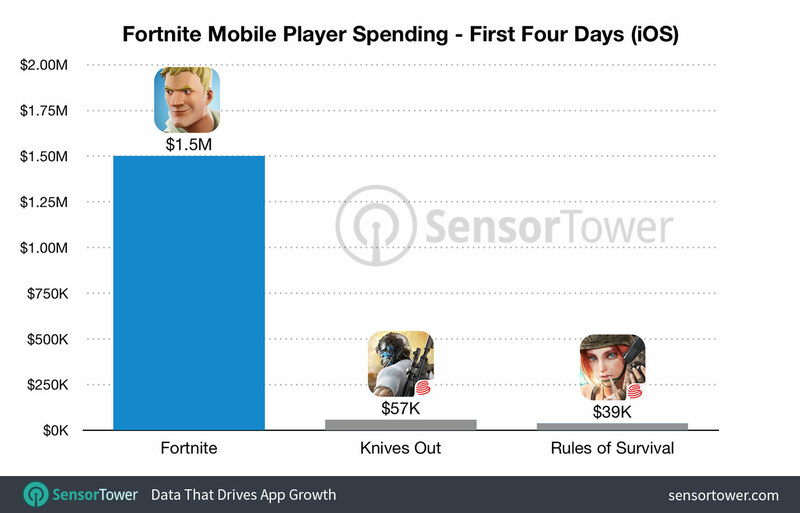 After the game’s launch, analytics firm Sensor Tower estimates that mobile Fortnite players spent more than $1,000,000 USD on the title in the first 72 hours, and $1.5 million in the first four days. The game pales in comparison to Pokemon GO (Free) and Clash Royale (Free) which earned about three times as much in their first four days of worldwide release on the App Store. However, these cases are apples and oranges to a certain degree. The obvious factor is that Fortnite is still in its Invite Event on iOS, and not everyone that can download the app can play it yet. Additionally, players can also buy V-Bucks on any platform they want with their account. Use V-Bucks to buy the Battle Pass on PS4, and it works on iOS. No revenue will count on the grossing chart, but Epic still gets paid. Additionally, Fortnite might suppress spending to a certain degree by only featuring cosmetic IAP, with a popular item being the Battle Pass, which unlocks new items and rewards as players complete objectives. Compare this to most mobile-native titles which do feature progression-enhancing IAP. Fortnite making so much money early on when it launches on a new platform and has a limited audience so far is quite impressive. Fortnite‘s popularity is also helping out its competitors. Thanks to some wonky App Store keyword functionality, the leading result for Fortnite on the App Store is actually Rules of Survival (Free) by NetEase. Sensor Tower reports that this helped the game increase its rank from number 14 to number five among free apps in the US. However, the game isn’t reaching the same revenue heights quite yet, as Fortnite massively out-earned the game in that initial four-day period. Once the hype dies down, Fortnite‘s spending performance on iOS might change, though the additional audience once the game goes public might help even out its performance. Fortnite‘s regular content updates and more straightforward monetization in comparison to the convoluted system the Tencent and NetEase battle royale titles use might also help Fortnite‘s monetization going forward. While we had no reason to doubt it, Fortnite on mobile is a hit.